Enjoy Golfing With Kids! Saratoga Springs NY Golf Courses Let You Have Fun & Teach Them To Love the Game! Yes, golfing with kids in Saratoga Springs NY can be a lot of fun! 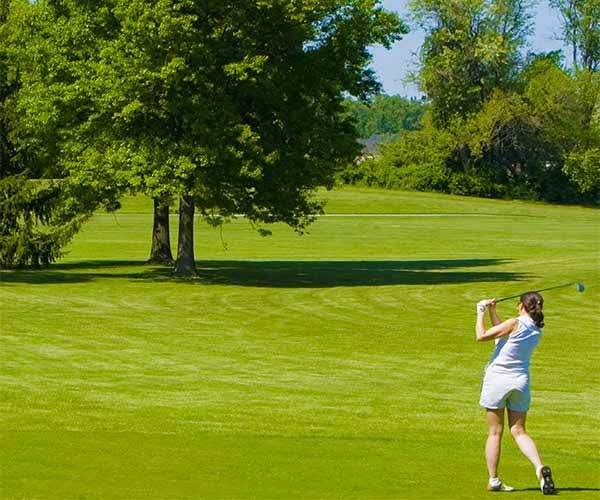 Want to have them playing right along side you on your favorite Saratoga golf course? If so, you're not alone! With the increasing popularity of the sport and the unique profiles of the professional golfers who lead it, golf has become far more attractive to young people, some as young as five and six years old. At this age, golf should be nothing but lots of fun, and learning can be integrated along the way. You can introduce your child to golfing at any point after they can hold a club! Early on they love to imitate, and making it fun is the most important part. You can teach them how to hold the club and swing, but do it for fun and only for short periods, and only if they're willing. Once they're old enough to learn the swing, the driving range is a great place for them to have fun hitting the ball. If you're taking your child on the golf course with you, there are things you can do to make it as easy and pleasant as possible. Go when it isn't crowded: the last thing you want is to pass along to your child the pressure you may feel from having people waiting on you, or the boredom of having to wait on other people. Their attention spans are shorter Ã¯Â¿Â½ period. Make sure your equipment is ready, and you have plenty of drinks and snacks. Relax! This is probably the most important of all. If you're upset, they will be. Yelling and constantly getting after them only make it worse. Don't wear out your welcome. Try for nine holes the first time. If it's too much, stop and try again another time. Kids have different likes and dislikes just as we do. If you find it's not their thing, don't force it...they may very well change their minds sometime down the road. Don't feel like you have to constantly be the teacher either, just having fun together will be enough to make them want to give it a go!